A good way to strengthen your friendships is sharing new and different activities, groups of friends all over the world choose a swim with dolphins in Cancun experience, that’s why today we bring to you 3 kinds of interactions that you will most likely want to share with your BFF. We want you to have an amazing time doing the best things in Cancun, therefore we have chosen the 3 best interactions for you, that will make your vacations unique and different. In this interaction, you will swim with dolphins in Cancún with 3 friends more, you will enjoy 60 minutes in the water and during the first 15 minutes your friends and yourself will receive instructions about how to treat dolphins and make the experience something unique. Something that you will love is that when deciding where to swim with dolphins in Cancún you can choose between Puerto Morelos, Punta Cancún, Interactive Aquarium of Cancun and our favorite: Riviera Maya Xplor, where there is Dolphinclusive Xplor, an all inclusive extreme adventure park and where you can also swim with dolphins. If you are on vacation with more than 3 friends and want to swim with dolphins in Cancun, there is another interaction that can be done with 9 friends more, can you imagine? Even though this experience lasts 15 minutes less than Primax 4, none of you will miss the opportunity to experience an amazing interaction with dolphins. 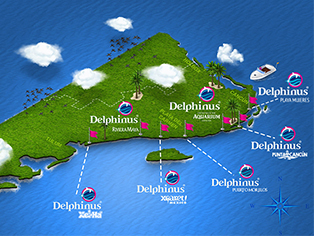 You are probably wondering: where to swim with dolphins and participate in the Splash interaction? You will find this interaction at the Interactive Aquarium Cancun, Puerto Morelos and Riviera Maya. Tell your friends that they don’t have to worry about transportation, if you are staying in the hotel zone, round-trip transportation is included, check the hotels that offer this! There is another perfect interaction for you, the Dolphin Interax. You can also invite 9 friends or more to this one, enjoy 14 different activities with the dolphins: kisses, hugs, jumps, among others, that will teach you about the importance of the dolphins in the marine ecosystem. This interaction has a great advantage which is that you can do it in Xel-há and Xcaret, in Xel-há you can swim with dolphins in an all inclusive way. Doing it in either of these aquatic parks will give you the opportunity to also do many other extreme activities that will strengthen your friendship and make you have a great time. If you don’t know the best things to do in Cancun, you now have 3 incredible options to enjoy the marine environment and the most fun aquatic parks in the Mexican Caribbean. Take advantage of the all-inclusive packages and enjoy an amazing vacation in Cancun with your friends.